In policy terms, December, 2008 is not turning out to be a keeper for French President Nicolas Sarkozy. Less than 24 hours after his government was forced to delay much touted education reforms in the face of protests by high school students, Sarkozy was forced to make big concessions to plans to legalize Sunday trading in France. Far from the sweeping liberalization Sarkozy had called for as part of his plan to let French employees "work more to earn more", the compromise bill will modestly augment the number of exceptional Sundays shops are already permitted to open. "We're no longer talking about a generalization of Sunday opening hours," crowed Marc Le Fur, a member of Sarkozy's conservative Union for a Popular Majority (UMP). "France and the French people remain fond of Sunday as a rest day. This text will conserve Sundays as a day of rest." Realizing he would not win this battle, Sarkozy amended the proposal. It now calls for doubling the number of exceptions to Sunday closing rules per year from the current five to 10, not counting the period prior to Christmas. Even then, however, city councils must approve local extension of Sunday openings, a green light that may prove hard to obtain after the nation-wide romp the Socialists enjoyed in municipal elections last spring. "Don't bother voting this text, because it won't be applied," warned Socialist Party leader and mayor of Lille Martine Aubry. "We'll be as ferocious in battling this project as we were the initial one." Perhaps. But the government still appoints regional prefects, and they wield veto power over how municipalities apply new laws. 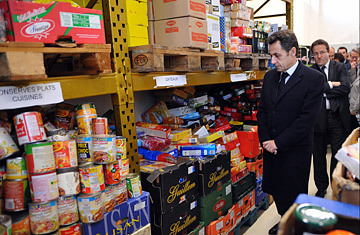 Sarkozy and Sunday-minded shop owners could yet have the last laugh yet. See pictures of France's Bastille Day celebrations. Read TIME's Person of the Year issue.